understanding splunk index - "This website is not affiliated with Splunk, Inc. and is not an authorized seller of Splunk products or services." Understanding splunk indexer | How to configure splunk indexer? Splunk indexer is most important splunk component. Basically its database of splunk where it stores all collected logs in smart way. As name suggests indexer collects logs sent by splunk forwarder (i.e. splunk agent installed on remote machine for log collection) and process those for creating index and raw data. Same as any book index it create index for all collected logs from your environment. Splunk indexer stores all data in indexer i.e. a directory In index splunk stores key keywords from logs and links to raw data (i.e. full logs) so that it can search logs with superb speed.Understanding indexer and indexing is important as splunk licensing model is based upon indexing volume processed by splunk i.e. more logs your indexer process more you have to pay. So configuring indexer properly will help you saving money.Splunk indexer receives data from forwarder on port 9997.We have to enable receiving on indexer to accept logs from forwarder. 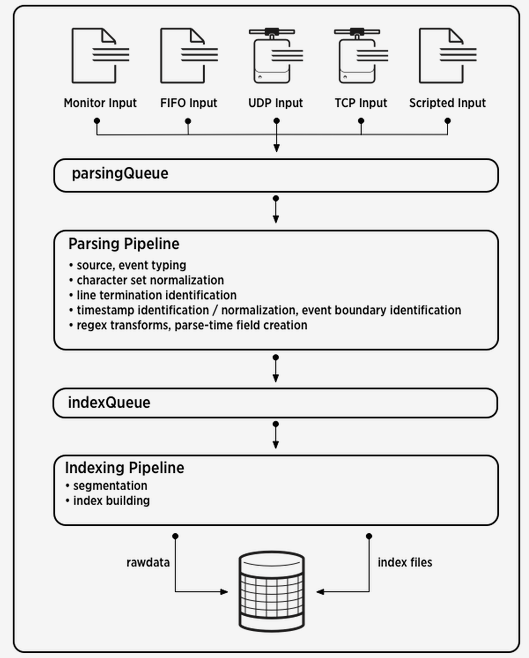 Below we will try to understand how exactly splunk indexing works and splunk indexer works in detail. a) Extracting a set of default for each event like host, source, and sourcetype. a) Breaking all events into segments called buckets that can then be searched upon. You can determine the level of segmentation, which affects indexing and searching speed, search capability, and efficiency of disk compression. b) Building the index data structures. Hot - this is the directory where all data is written and the most recent data is kept here. Cold - rarely searched data as it has aged or been archived (rolled) to this bucket. While read only and still searchable, this is considered the archive tier. Frozen - this is data that is pushed to a dead media like tape or deleted. 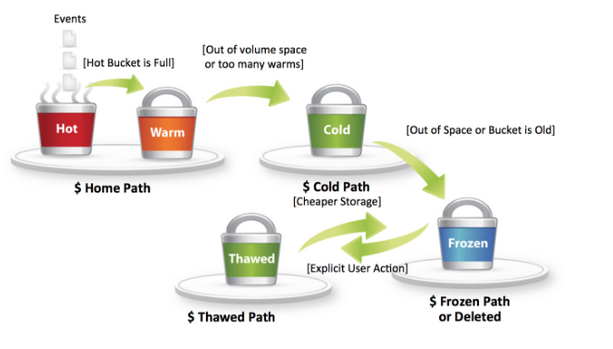 There is a thawing process possible if not deleted completely to allow data to be pushed back into higher tier buckets. Important: Specify the size in megabytes. Proper configuration of splunk indexer is key for a successful splunk environment. How to create new index in splunk? There are multiple ways to create new index in splunk indexer.You can achieve it t through GUI/CLI or simply editing index.conf at $splunk home/etc/system/local.Simplest way is through GuI.If number of index are more then simply edit inputs.conf and add all index name to it.Below arw steps for the same. How to create a new index using index.conf? How to create new index using splunk GUI? 1. Login to splunk, navigate to Settings > Indexes and click New. The frozen archive path. Set this field if you want to archive frozen buckets. How to Create indexes automatically in splunk?